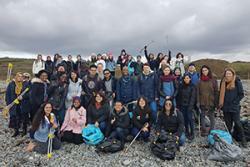 The international students who took part in the beach clean.A team of 50 international students from all over the World took part in a Beach Clean in Cricieth recently. This was organised by the International Student Support Office at Bangor University as part of their Sustainability Project: Rhyngwladol Wyrdd!/Internationals Go Green! together with The North Wales Wildlife Trust. Little did they know that a large amount of litter was expecting them in such a famous an iconic Welsh beauty-spot. The students, who gave up their free time to help the environment, ventured to the furthest part of Cricieth beach with litter picks, bin bags and tons of enthusiasm. In only 2 hours, 26 big bags of litter had been collected with anything from plastic bottles to fishing gear and cans. No matter how much work they put in however, the beach could not be totally cleaned. The reason? The extended use of single-use plastics, littering and waste disposal has become a worldwide issue in the past decade, threating entire ecosystems and human wellbeing. As plastic breaks down into tiny micro pieces, it enters the food chain and ends up on our plates. And no, we are not talking about tropical, faraway lands. We are talking about our waters too. 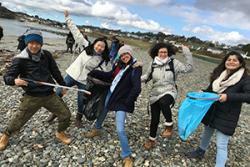 Portuguese student Ruth Gabriella Fernandes, in the middle, during Cricieth’s Beach Clean“The beach clean at Cricieth was a real eye-opener. From afar, the beach looked pretty clean and beautiful, but when you look closely amongst the weeds, it was the tiny plastic that made up most of the litter.” Two of the most common items found were bottle caps and, believe it or not, earbuds. 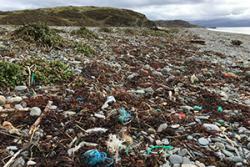 Hundreds of earbud plastic sticks washed ashore were collected in just a morning in Cricieth due to inappropriate disposal. “The enormous amount of earbud sticks that we found and collected from the beach made me appreciate how simple mistakes made in the bathroom, as regards to waste disposal, pose a threat to marine ecosystem some miles away” said Gracious Ali, a Malawian MSc student in Public Health & Health Promotion. A group of Bangor students are campaigning to make Bangor the first Plastic Free City in the UK, and we can all do our bit to help the environment. “Going plastic free is really the way to go to avoid contaminating the oceans. If not plastic free, recycle and reuse your bottles, avoid dumping earbuds into toilets and avoid using straws!” said Ruth as she was piling bags of litter after a morning of volunteering. An example of the litter which faced the volunteersWe can make a difference, it is not too late. By making little daily life changes in our behaviour we can secure a cleaner environment that will be better and safer for us and for the next generations. However, this implies making an active effort towards a better future.